The power of social media within business – both for individual professionals and organisations as whole – is growing. It gives companies the power to amplify sales, win new contracts, update shareholders and influence audiences. In addition, social media is now increasingly used as a recruitment tool, with both employers and employees regularly accessing and searching profiles online. However, is social media a double-edged sword for business and should you be approaching it with more caution? Having a good social media presence has become increasingly important over the years with social media playing a huge part in most people’s lives. The average person has five social media accounts and spends around 1 hour 40 minutes a day browsing these networks1, according to the 2015 quarterly report from GWI. However, social media no longer just applies to a person’s private life, but now undeniably crosses over to the workplace. It is also a key tool in the modern-day job hunt, with research firm Aberdeen Group2 claiming that 73% of 18-34 year olds found their last job through a social network. Therefore, having a certain look and presence on social media is an important factor that will be considered by your future workforce. A recent study by the Society for Human Resource Management3 found that 84% of employers recruit using social media, and 43% of employers screen job candidates through social networks and search engines. The same study also found that 36% of companies have actually disqualified job candidates after doing an online search of the applicant’s social media. The pressure to look a certain way does not just apply to the recruitment process. Many companies expect employers to have a strong photographic and even video profile on the company website and external social media platforms such as LinkedIn. There is no wonder then that the pressures of social media may be adding to the unease and concern we feel about our appearance. In my practice, I’ve seen a huge increase in the number of patients who are concerned that the way they look is affecting them getting a job or a promotion. This manifests itself in a number of ways; ranging from a lack of confidence when meeting potential employers and clients, feeling pressures to retain a youthful, fresh face and worries that someone younger may be chosen over them for a promotion. And, these uncertainties are now felt across almost all job sectors, from teaching to law and business. So, are people just being vain or is there a real cause for concern? The truth is as we age, our faces do change. For example, one of the earliest ageing changes is the descent and deflation of the brow, as well as lack of “volume” in the face. The loss of that former youthful look can be upsetting, especially when updating your social media profiles and it triggers a noticeable change amongst your followers. However, employees should be reassured, that the ageing process is perfectly natural as it happens to everyone, it should never be acceptable to judge other or yourself on this basis – in particular in the workplace. Having said that, it’s natural for people and employers to want to give the right impression on their social media profiles. Give employees clear guidance on your company’s expectations of what images can and can’t appear on social media profiles. Ideally, develop a social media policy for employees to avoid any misunderstanding and potential reputational damage to the organisation and its workforce. If looking at potential candidates on social media try to give everyone with the same qualifications an equal chance. Don’t choose someone on whether they are more attractive or younger looking than the other. However, saying this, avoid someone with inappropriate photographs as they are unlikely to fit in with the company’s image. New employees should be briefed on the company’s social media policies. Include specific social media rules in an employee’s contract to ensure they have it in writing and are aware of the requirements. Give employees ample notice of any new photo requirements to allow time, if needed, to prepare for the shoot and make sure they feel comfortable and confident in front of the camera. Using a professional photographer with experience in company profiles and head shots can make the world of difference. A good photographer will be able to make the employees feel at ease, advise on the best pose, facial expression and background. If you expect your employees to have LinkedIn profiles, to connect with other professionals and potential clients, provide help and guidance on how you would like the profile to look. If necessary have a department who are able to take charge of this, e.g. 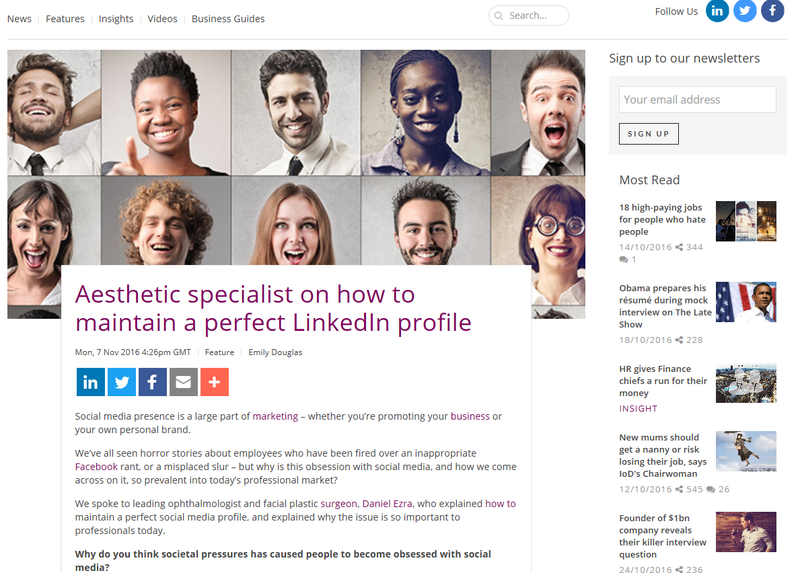 marketing or HR, and give guidance, they can offer support on profile pictures which can give the employee more confidence about their social media presence. Whilst very much down to personal preference, aesthetic “tools” such as good make-up and hair styling can be used to highlight and exaggerate features, this can make employees feel more confident. If an employee is anxious about updating their social media profile, ensure you offer support and reassurance and give them the opportunity to discuss their worries in confidence. In some cases, employees may have a real concern about their appearance due to a specific problem e.g. extreme bags under the eyes or protruding features, and may be able to seek advice on treatment. 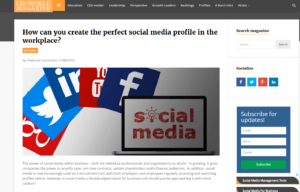 While creating a social media profile is now almost a necessity in the work place, there is still a need to clarify your expectations of your employees in this area. Employers need to be aware that many people have anxiety when it comes to their physical appearance and therefore updating their profile picture can be daunting, especially with tools such as the ‘like’ button, getting no ‘likes’ can cause a loss in confidence. In my experience, the consultation process with a potential patient can sometimes identify an underlying psychological problem related to body image and self-esteem, which needs to be addressed immediately.